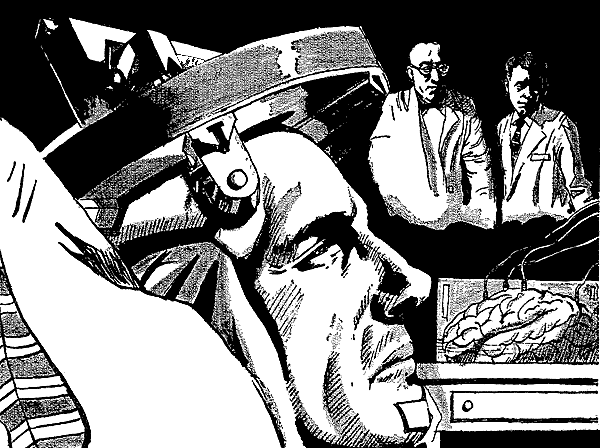 Biology in Science Fiction: Hand transplants, face transplants ... and brain transplants? Hand transplants, face transplants ... and brain transplants? If you can believe what you read in science fiction, in the future we'll be able to swap out any damaged or malfunctioning body parts for new and better functioning replacements. But not only are there serious ethical issues to be considered before that can become a reality - where or who do the replacement parts come from, exactly? - there are also many technical hurdles that need to be overcome. So what may the future bring? There was a lot of buzz last month about a major surgical achievement: a man who had suffered severe facial disfigurement from a gunshot wound received a full face transplant. Using techniques less than a decade old, the transplant included facial tissue from his hairline to his neck, and included a replacement of his upper and lower jaw and teeth. The results were stunning. Face transplants represent just the latest step in the development of transplantation technology over the past century. Experiments on dogs and other non-human animals beginning in the early 1900s demonstrated that limbs could indeed be transplanted successfully. But there were serious complications caused by infection and rejection of foreign grafted tissue. And even if the procedures could be successfully used to help human patients, there was a lack of donors. It wasn't until 1944, in the midst of World War II, that Lieutenant Richard H. Hall, a member of the Navy medical corps, proposed a method for human arm transplants. The time was ripe: recently developed sulfa drugs, penicillin, and other antibiotics could prevent loss of the transplanted limbs to infection. And there was a need. With no end of the war in sight, Hall noted that "there is certainly a growing demand for this procedure." He proposed that "civil or military casualties" could be used as donors. It's terrible to consider, but wartime created a flood of both potential recipients and deceased donors. It turns out that Hall was decades ahead of his time. In 1964 the first human hand transplantation was performed, but that failed after two weeks when the hand was rejected by the recipient. It wasn't until 1998 that a hand transplantation was performed successfully. And the first successful arm transplantation followed in 2008, more than 60 years after Hall's paper was published. By curiosity, I know a bit about such things. A big surgery journal, back in the '40s, had published a visionary article on grafting a whole limb, with colored plates as if for a real procedure[A]. Then they'd developed techniques for acclimating a graft to the host's serum, so it would not react as a foreign body. First, they'd transplanted hunks of ear and such; then, in the '60s, fingers, feet, and whole arms in fact. "[...] When you cut your finger, it can heal in two ways. Usually it bleeds, scabs, and skin grows under the scab, taking a week or so. But if you align the edges exactly, at once, they may join almost immediately healing by First Intent. Likewise in the brain, if they line up cut nerve fibers before the cut-off bit degenerates, it'll join up with the stump. So, take a serum-conditioned brain and fit it to the stem of another brain so that the big fiber bundles are properly fitted together, fast enough, and you can get better than ninety per cent recovery." "[...] There's a place in the brain stem called the isthmus, no cell masses, just bundles of fibers running up and down. Almost all the nerves come off below that point; and the few that don't can be spliced together, except the smell nerves and optic nerve. Ever notice I can't smell, Willie? And they transplanted my eyes with the brain—biggest trick of the whole job." You'll have to read the whole story to learn about what sort of man is willing to risk being a brain donor. 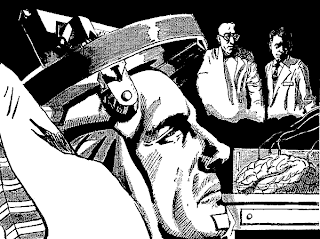 Of course there's no real world brain transplantation, at least not yet. And maybe we're more likely to have our memories, thoughts and emotions uploaded to a computer than have our brains transferred to a new mortal body. Only time will tell. On a side note, I am quite curious about the author Anne Walker. I've only found one other story attributed to her, published in 1961, and then she disappears. Was she a doctor or other medical professional? if not, how did she come across a Hall's article in a medical journal? If any of you readers have more information about Walker, I'd love to learn more about her. 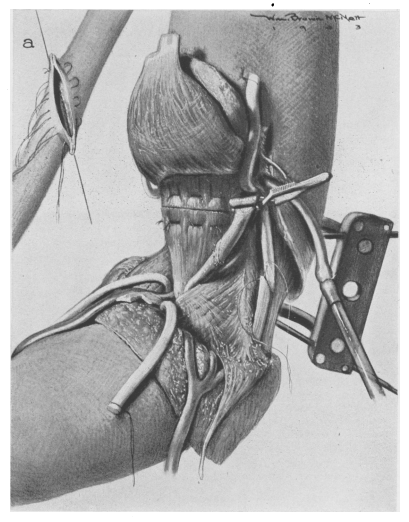 Top image: Hall (1944) Figure 3 "Donor graft in place on recipient, medial aspect. Closure partially completed. (a) Details of vascular anastomosis."